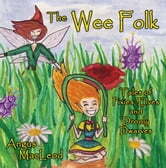 The Wee Folk is a book about the Pixies, Elves and Drooly Dwarves who live in the Great North Woods which lies just below the magical kingdom of TooDoggone. This book will also answer a few questions like: How come we have an Easter Bunny and not an Easter Chicken delivering eggs at Easter? Or can Santa’s reindeer really fly? And what about purple peanut butter, have you ever had any or do you know how to make purple peanut butter? All these secrets are revealed in the pages of the stories about The Wee Folk. About the Author: Angus MacLeod loves telling stories. He created his first Wee Folk story when his kids were very young. Over the years, Angus wrote several more tales about The Wee Folk. He would bind photocopies of his stories with leather laces and beads and then give them to family and friends to read and enjoy.